Seems the June melt pond fraction may be higher this year than it's been for a while. How did the June melt pond fraction look like back in 2007-2008, 2010-2012 and 2016? Wipneus' graphs based on JAXA AMSR2 data suggest that surface melting has been below average in the last few weeks, compared to previous years. As expected the fast ice has reappeared in the Laptev Sea. The "torching" expands to the ESS, where some curious scribbles can now be seen. Frozen leads was the best explanation if I remember correctly. Thank you Wipneus. I consider your animated images of regions in the Arctic some of the most informative posts when it comes to tracking the melt season. Don't feel the need to match the volume of posts you have done in the past but occasionally zeroing in on regions of interest or rapid change is very much appreciated. 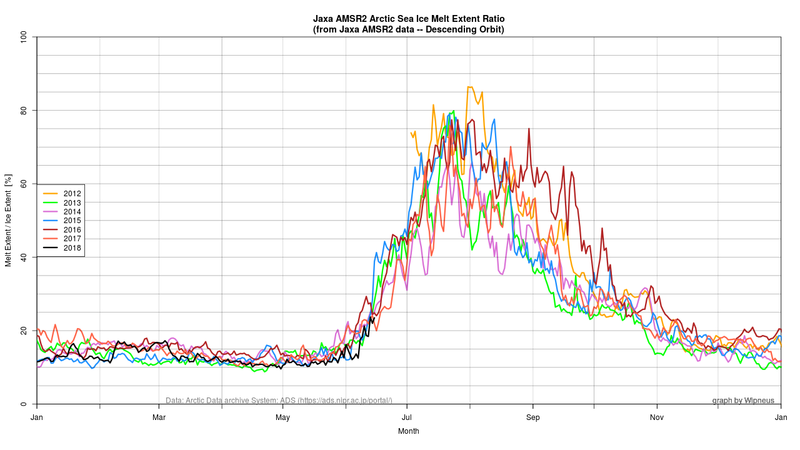 Update of the Jaxa AMSR2 sea ice thickness/melt animation. During the melting season thickness is rather without meaning, but the melting area should be interesting. Here I combine the Ascending and Descending data: in melting if detected in either, else average thicknesses. Area with melt has increased considerable (>70%) as the Jaxa AMSR2 thickness/melt data shows. Only 2012 and 2015 had a bigger ratio. For comparison here are 2012 and 2015 for the same data. Concerning! In addition, your animations show the melt to dry ratio increasing. Climate Reanalyzer has the current low pressure system moving to and then sitting over the CAB/CAA region over the next few days, so that shrinking green area may be somewhat protected for a little while, but there could well be considerable insolation elsewhere. The forecasts also have a lot of precipitation falling - there was considerable rain over the Laptev, ESS and across the Chukchi into the Beaufort. There will be more waves coming in, and I'm sure that's contributing to the reduced albedo we are seeing over those regions. Ice concentration in the CAA "recovers" after an enthusiastic start in first half of June. In the regional area graph several ( if not most) other years show similar behavior. In the animation watch the Nares arch collapse. Is that the sort of thing the algorithm would tend to show for a progression of dry snow>damp snow>damp ice as the surface? 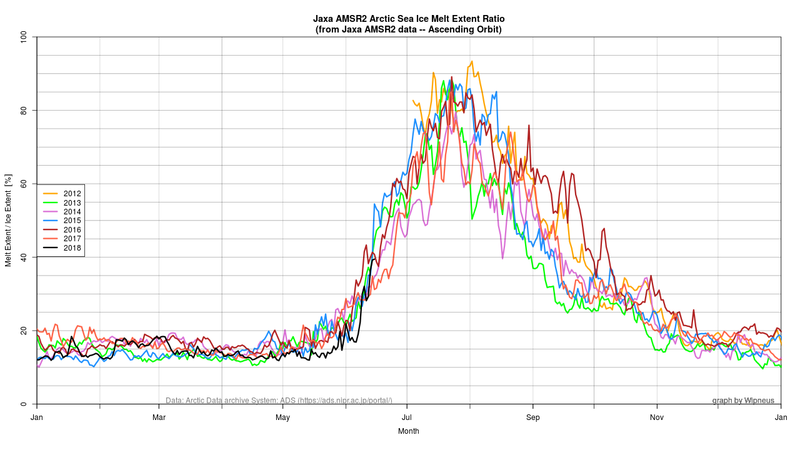 Highest surface melt ratio for the date of all years in the Jaxa/ADS thickness/melting data. DR, I'm not sure which part you are asking about so I'll provide a (hopefully correct) full response. JAXA is calculating which parts of the ice surface are in current surface melt conditions (i.e. the ice top is "wet"), using data provided by the AMSR2 satellite. This is shown in the map Wipneus provided. Wipneus is calculating the percent of the surface in melting conditions out of the total surface, this is shown in the chart he provided. The black line represents this year's percentage, which is currently slightly above 90% and the highest of the years for which data is available (since mid-2012). I sort of gathered that of the ice that is still there this is a whole lot that is currently melting on the surface, but I have no clue what that is trying to tell me. I can see where ice melting on the surface for a long time means something, but I don't know what ice melting at the moment tells me. With the Greenland melt, the number of days in the picture tells me a lot, but I never understood if the melt today told me anything....it is the same way here. The data is what it is and each can make their own conclusion. But I would assume that even a few days of top melt can lower albedo significantly. On the other hand to actually make the ice thinner the effect is cumulative and depends on how many days the ice spent in melt conditions. But in any case the chart shows general conditions in the arctic right now, something which is interesting by itself. Oh! I think you are telling me that top melt now makes more melt later easier. I can sort of understand that. I guess it is the same with Greenland, really....though there you have a mountain to divide states. I agree - the implications are not necessarily intuitive. One thing I find compelling about it is how it stands in contrast with the weather conditions which based on previously observed outcomes are highly conducive for preserving the ice. The contrasting forces suggest to me a system which is in a very chaotic state. I think that if there are some melt ponds on the surface of the ice at around 0-1°C it does not mean too much (apart from albedo). But if these conditions are stable for a longer period of time these melt ponds can destroy the structure of the ice ("hydrofracturing"), especially when it is sunny. Then these little ponds can penetrate into and through the ice (see the collapse of Larsen B in 2002) and by this way reduce the size of the ice floes and increase the surface to volume ratio massively which also will reduce the resilience of the ice against waves and increase its mobility. it certainly did not benefit the ice in 2012 to spend so many days at the top of Wip's melt ratio graph . Will be an interesting measure to follow in the coming weeks and years . Any scale to the colour scheme on the JAXA thickness map ? b.c. I agree the melt ratio does not fall into well established metrics. Jaxa is not very clear about it and suggest its use is "for the usages of research and validation of algorithms"
There was a presentation on the web that showed how the algorithm was developed but the link is dead now. I try to attach it to this message as it is a pdf. In the mean time I use the data as Jaxa suggests. The observation is that 2018 had a low melt ratio earlier in the year, that has now reversed. The theory says that early onset of melting is important for ice loss, so this is probably not going to catastrophic for the ice. Oh there are no scales for the thickness and melt colors. I will provide them as soon as I can. In the mean time, see attached. Nearing a triple century (-276k) extent drop, more than half in the Hudson region very little in the Arctic Basin. Some Hudson ice may rebound in the coming days (it always does), but the trend is clear. that's the kind of free fall i expect more often and in more places in the near future because there a quite a few places where is is thin and fragmented and given the right conditions it can happen this way all over the place. considering that Kara is facing a similar situation right now, the next candidate IMO would be beaufort. southern beaufort is permanently fed with fresh and weak ice from the northern parts and it's going to melt out there, only that once the fountain will be either depleted, gone for good itself. i posted on the idea a few days ago taking the barrows web cam as a source of observation. the bay was ice free already and now gets fed with fragments that melt out day after day, at least that's how i see it. I agree the Kara has begun a period of aggressive melt and will melt out entirely by the end of the melt season which has been the case for the past 6 years. The Kara Sea melt can have no impact on achieving a new minimum. 2018 is well (over 3 centuries in either extent or area) below 2013 and 2014. Nearly 3 centuries above 2012 extent. The 2012 source is (UH) SSMIS, AMSR2 data does not start until August, so has some additional uncertainty. Attached is an animation of the (North) Greenland Sea comparing 2018 with 2013 which has the lowest extent for end of July. Sea Ice looks rapidly melting, and more of the fast ice has become mobile. The animation needs a click to start. It is a little bit out of topic at this time of the year, but I find interesting that even if we don't break absolute records right now, on yearly average we are quite low, the record being for the time frame 2016 03 29 to 2017 03 28 at 10.11361. Values are in 10^6 sq km. * Since you use NSIDC data I think this belongs in the sea ice extent and area data thread, as this thread is dedicated to AMSR2 data. I suggest to move it there. * Why not update the chart all the way to the present? I assume it's a trailing 12 month average. No problem, it is now posted in the other thread. Just that end 2016, I used to post it here. It's a trailing 12 month average, didn't know the English word to describe such a graph. Thanks for the info. The graph goes all the way to August 8th, 2018. It starts December 31st, 1989, which means that the datas used start on January 1st, 1989. There where too many holes in the dataset before that date to make it easy to use. I could do it easily fot the sea ice area, just that I don't know where to find the dataset. If somebody provides a link... Jim Hunt provided the link to the dataset for this graph. A trailing average when you have the data in a csv format is just so easy to do. In 2016, I also calculated a trend, and that was much more work. I gave up the trend concept because the general direction is easy to check, and since we don't know if it is linear, parabolic, exponential ... it doesn't bring much more information than telling the reader that I can calculate a linear trend line. Do you offer a permanent link for the Greenland Extent png ? Has there been any word on what's happened to the Uni-Bremen site? I am sorry but I have no idea. I failed this morning to look at their latest information. And tonight it is still off-line. What I am very sure about is that there is no holiday in Bremen today. No JAXA extent data since the 11th. I don't have the software to display it myself. I'm not sure why other sites are not updating. torching in Fram Strait and above.